Situated in an enviable position on the sought after Penfold Grange development and overlooking a small green with a central oak tree. The hall leads to a double aspect living room with an archway through to the dining area. The kitchen has been refitted and has an integrated oven and hob. In the dining area, replacement patio doors with a built in dog flap lead to the garden that is a good size with a high degree of seclusion and has a westerly aspect. The first floor landing gives access to two double bedrooms and the bathroom has a modern white suite. The garage with additional parking to the front is ideally located just to the side of the house. Staircase to first floor, radiator. The kitchen has re-fitted units with high gloss base cupboards and eye-level units with contrasting granite effect work surfaces, comprising single drainer single stainless steel sink unit with mixer tap having base cupboard under, space and plumbing for washing machine, further 'L' shaped work surface with inset four ring gas hob with integrated oven under, further base cupboards and drawers, space for tall fridge/freezer, stainless steel extractor hood over hob, eye-level units, concealed gas fired boiler, tiled floor, double glazed window. Access to roof space, radiator. Airing cupboard housing hot water tank, double glazed window, radiator. 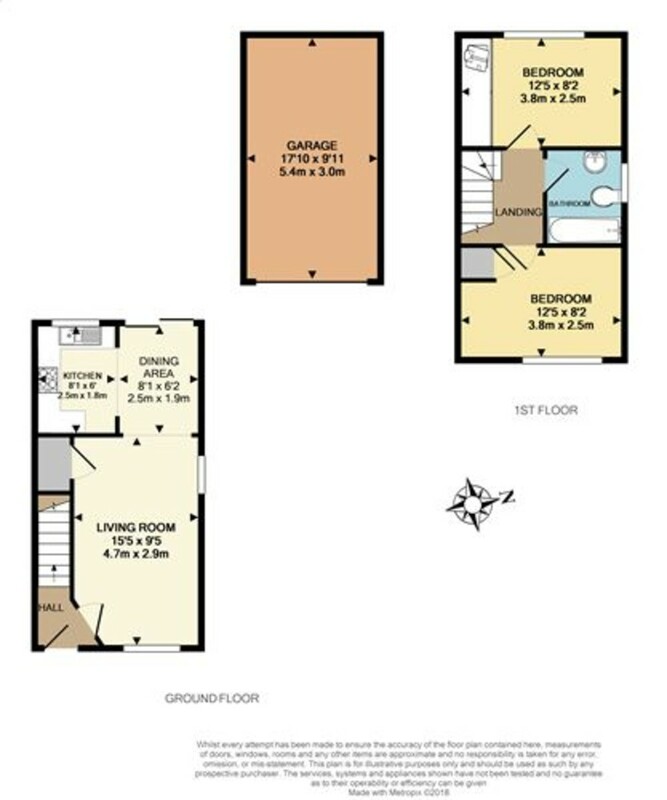 White suite comprising: shaped panelled bath with twin hand grips, mixer tap and shower attachment (curtain and rail), pedestal wash hand basin with mixer tap and mirror over, light/shaver point, w.c., radiator, part tiled walls, double glazed window, extractor fan. Situated adjacent to the rear garden is a brick built garage with pitched and tiled roof, up and over garage door, power and light. Immediately adjacent to the property is an area of decking which leads to a good sized area of lawn with central stepping stone path. Towards the rear boundary is a timber cabin that we understand to be dry-lined, insulated and have power and light and is on a concrete base.